Beaches, Harbour, Pier, Promenade, Cliff Tops and Coastal Scenes - DT6 4EN / DT6 4HE. Harbour Cliff Beach - East Beach and East Cliff Beach - DT6 4EN. Danny Latimer's Floral Tribute - East Beach car park, southeast access to beach - DT6 4EN. Broadchurch Police Station (exterior) - The Folly (ground floor), Quay West - DT6 4GZ. 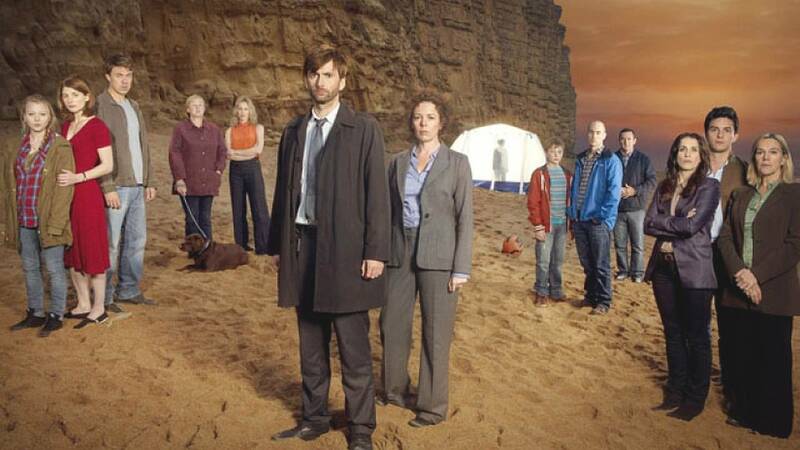 Broadchurch Police Car Park - Quay West underground car park - DT6 4GZ. 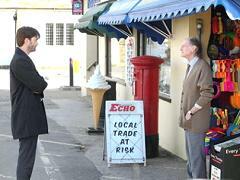 Broadchurch Newsagent (exterior) - Harbour Newsagent - DT6 4EN. Broadchurch Café - Ellipse Caffé Bistro - DT6 4GZ. Broadchurch Sea Brigade Hall - Methodist Chapel on East Beach - DT6 4EN. Newsagent Owner's Home - Coastguard Cottages (seaward end) on East Beach - DT6 4EP. 'Operation Cogden' - Named after Cogden Beach (3 miles east of West Bay). DS Ellie Miller's Safe Home Apartment - Chesil House - DT6 4EW. Station Yard Car Park - Filming equipment storage - DT6 4EL. Briar Cliff, Coastal Hut / Chalet - Eastern base of Thorncombe Beacon - DT6 6AL. Susan Wright's Caravan - Freshwater Caravan Park - DT6 4PT. Beach - One scene - DT6 6LL. Broadchurch High Street - Hill Road - BS21 7PH / BS21 7NZ. 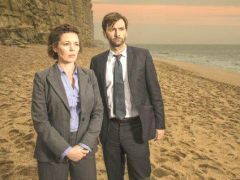 Broadchurch Echo Newspaper Office - (disused) H Seeley Newsagent, 61 Hill Road - BS21 7PG. Traders Hotel (exterior) - (disused) Lloyds Bank, 22 Hill Road - BS21 7NZ. Broadchurch Parish Church (St Bede) - St Andrew's Church, Old Church Road - BS21 7UE. South Wessex Secondary School - Clevedon Community School, Valley Road - BS21 6AH. School Sports Day - Yeo Moor Primary School, Kennaway Road - BS21 6JL. Miller Family Home - St Andrew's Drive - BS21 7UG. Latimer Family Home - Lavington Close - BS21 7XD. Marshall's Field and Bank - BS21 7XD. Poets Walk and Wain's Hill - BS21 7TY. Part of Traders Hotel interior - Walton Park Hotel, Wellington Terrace, (seafront) - BS21 7BL. The Pill (Anglo-Saxon, meaning a creek or inlet) - BS21 7UW. Marine Lake, built in 1929 (burning boat scene) - BS21 7TY. Amusement Park and Skate Park - Salthouse Fields and Seafront - BS21 7TY. Clevedon Arcade, Elton Road - BS21 7EH. Twin Transmitter Masts near Latimer's Home - BBC Radio 5 Live (Medium Wave) - BS21 6UU. Co-operative Supermarket (now Aldi) and Car Park, Wyndham Way - BS20 8LR. Vision Studios, Old Mill Rd - BS20 7BX. Stanshawes Garage, Westerleigh Road - BS37 4BG. Eggshill Lane Play Area - BS37 4BH. 'Road to Nowhere', an incomplete stretch of dual carriageway built in 1974 on Yate Common - near BS37 8RX. Part of Traders Hotel interior - Bowlish House Hotel, Wells Road - BA4 5JD. Weston-Super-Mare Hospital, Grange Road, Uphill - BS23 4TQ. Uphill Boat Yard, Uphill Wharf - BS23 4XR. National Newspaper Office - Bristol Post newspaper offices, Temple Way - BS2 0BY. BASE - central hub where catering, make-up and wardrobe are kept during filming. TECH - camera crew, etc. location. LOC - directions to the filming location.